World markets are unsteady, unemployment is on the rise, housing foreclosures are up, asset values are down, and the political landscape is shifting. Under such tumultuous conditions, people often look to leaders to soothe battered nerves. But in today's rough and tumble environment, there are reportedly few leaders the average person relies upon. Over 80 percent of Americans believe that we are in the midst of a major leadership crisis. And over 75 percent of executives from around the world are seriously concerned about whether businesses can develop good leaders for the future. And yet not one leadership book squarely addresses the issue of the changed workforce, the virtual workforce, and why old leadership models just don't workuntil now. The virtual workforce is a relatively new phenomenon. The Virtual Distance Model provides the quantitative data and predictive power needed to understand how new behaviors, born out of the Digital Age, impact performance, innovation, and other critical success factors. And now the time has come to reshape leadership models to best serve worldwide organizations in the twenty-first century. Leading the Virtual Workforce does just thatpaving the way for future leaders to create unmatched competitive advantage and performance improvements in the growing world of virtual work. 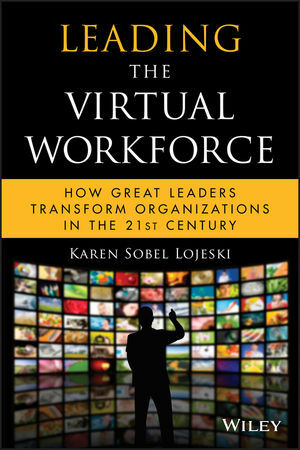 KAREN SOBEL LOJESKI, PHD, is a Professor at Stony Brook University in the Department of Technology and Society, author, and founder of Virtual Distance International (VDI), an advisory firm specializing in virtual teams, leadership, innovation and learning in the new millennium. Prior to launching VDI and joining Stony Brook, Karen spent eighteen years in corporate America. She held leadership positions at Chase Manhattan Bank N.A., Mercer Consulting Group, and Stratus Computer, Inc. She was Chief Operating Officer for Prolifics, a JYACC company, and Vice President of North America for Xansa. She is a popular speaker on Virtual Distance and other unintended consequences of technology in the wired workplace, school systems, families, and society as a whole.